We want to thank Eliana Chinea and everyone at The Green Yogi for supporting our efforts to save our seas. Stay tuned for more ocean benefits coming soon. Contact us if you'd like to be part of making an Ocean Benefit happen in your area. Had to share this beautiful video of a few of our favorite things; the ocean, paddleboarding and whales. Help us protect our planet! Why we use recycled plastics?? A seasonally inspired stream for the curious, but distracted. School is out, but science is everywhere. Seabirds like albatross, petrels and penguins face a growing threat from plastic waste in parts of the Pacific, Atlantic, Indian and Southern Oceans, according to a new study published on Monday. Brightly colored floating bits – debris that includes items such as discarded flip-flops, water bottles and popped balloons – often attract seabirds, which confuse them for food like krill or shrimp. Many die from swallowing the plastic. The problem received some national attention in 2013 with the documentary “Midway,” which showed a remote island in the Pacificcovered in corpses of baby albatross. Their exposed innards revealed lighters, bottle caps and toothbrushes mistakenly fed to them by their parents. The number of incidents like these is rapidly increasing, according to the new study in Proceedings of the National Academy of Sciences. Researchers from Australia and Britain analyzed a number of papers from 1962 to 2012 that had surveyed 135 seabirds. The team found that fewer than 10 percent of seabirds had traces of plastic in their stomachs during the 1970s and 1980s. They estimated that today that number has increased to about 90 percent of seabirds. And they predict that 99 percent of all seabirds will swallow plastic in 2050. For Erik Van Sebille, an oceanographer at Imperial College London and co-author of the paper, the most surprising findings from their analysis were the locations where seabirds were most likely to ingest plastic. Researchers had previously thought that giant garbage patchesswirling between Hawaii and California were the most likely places where birds would eat the waste. 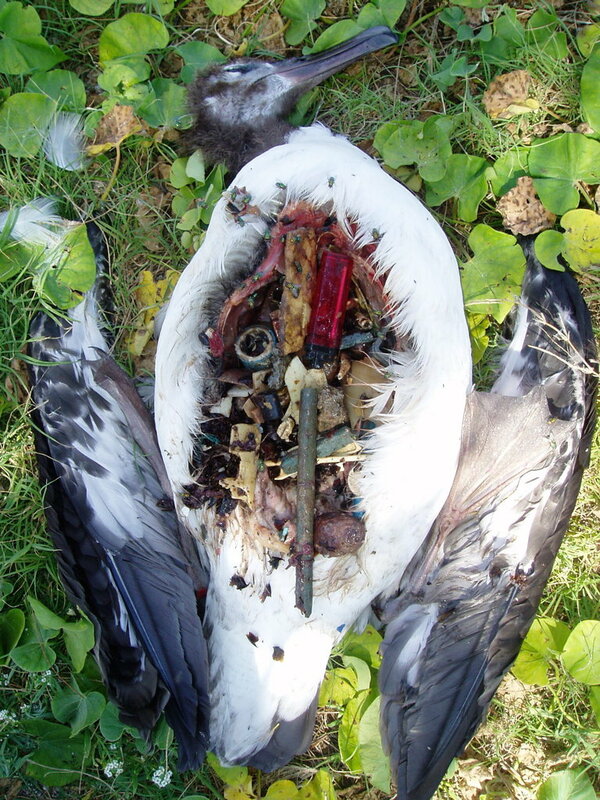 Instead, most seabirds are ingesting plastic at hotspots that stretch from Australia and New Zealand to South Africa and Chile. Boris Worm, a marine biologist from Dalhousie University in Nova Scotia who was not involved in the research, said that seabird deaths are the most visible sign of a larger threat that plastics pose to marine wildlife like fish, whales and sea turtles. “It’s an indicator that our world is literally getting clogged by plastic,” he said. The study’s authors suggest stricter regulations on plastic production, consumption and disposal, as well as the development of plastics that degrade in seawater. Global plastic production has doubled every 11 years since the 1950s and currently tops 300 million tons per year. Currently more thanseven million tons of plastic trash end up in the ocean, often a result of improper dumping into rivers that wash into the sea. We had a great turn out for our Ocean Benefit at 5 Point yoga in Malibu with special guest instructor Amy Rose. Thanks So much to everyone who came out and donated!!! We raised money for the 5 Gyres non profit organization and raised some awareness about a very important cause. 5 Gyres works to keep plastic out of our oceans and clean plastic that has already found its way to sea. Check them out at 5gyres.org. What is a "Gyre" you ask? Our oceans are dynamic systems, made up of complex networks of currents that circulate water around the world. Large systems of these currents, coupled with wind and the earth’s rotation, create “gyres”, massive, slow rotating whirlpools in which plastic trash can accumulate. The North Pacific Gyre, the most heavily researched for plastic pollution, spans an area roughly twice the size of the United States. Designed to last, plastic trash in the gyre will remain for decades or longer, being pushed gently in a slow, clockwise spiral towards the center. Most of the research on plastic trash circulating in oceanic gyres has focused on the North Pacific, but there are 5 major oceanic gyres worldwide. Cetaceans, all sea turtle species, and a growing list of fish species have been documented with plastic in or around their bodies. When marine animals consume plastic trash, presumably mistaking it for food, this can lead to internal blockages, dehydration, starvation, and potentially death. Also of deep concern for societies are the potential human health impacts of toxic chemicals entering the marine food chain through plastics. Science is beginning to ask the question: do chemicals such as PCBs and DDTs that sorb onto plastic pellets get into the tissues and blood of the animals that eat plastic? Do these chemicals work their way up the food chain, becoming increasingly concentrated and potentially entering our bodies when we eat seafood? This is a problem we need to solve immediately, and it wont be easy. We are up against some huge corporations who are more concerned about their stock price then the environment. But If we all work together as a team, this planet might still have a chance. Harvest founders Jason Moriarty and Michael Butler with Amy Rose.